Google My Business (GMB) listing users have always had the ability to add and edit their own menu links in the info tab of their dashboard. However, if you’re a restaurant owner there’s even better news. 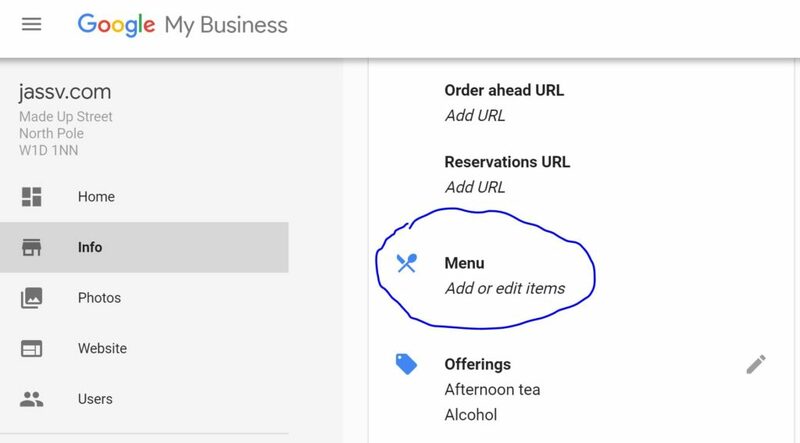 GMB listing users can now display their menu directly on their Google listing for users on mobile devices by adding their own structured menu using the GMB Info tab. The editor allows you to add the relevant menu items along with the title, description and price. You can even create separate sections of the menu such as starters, mains, desserts. Sounds awesome, so how do I get started? Which countries and industries is this feature available to? Currently, Google are only offering this feature for English speaking locals and food establishment business types. However, they’ll be looking into potential further expansion, including expanding it globally and to other business types. My menu is build using a 3rd party tool, how can it work for me? In terms of 3rd party structure menu data, if you are currently partnered with a 3rd party, their structured data will be what appears in the listing. Only listings without 3rd party data will have the ability to add their own structured menu content. If you are currently partnered with a 3rd party and no longer wish to be, Google advises that you reach out to your third party directly. Help! My listing is displaying an incorrect menu, what can I do? If one of your listings is currently displaying an incorrect menu, please see this help center link for more information on how to correct or remove the link.